Irish-Americans and lots of other people eat Corned Beef Cabbage on St Pats Day, as a nostalgic reminder of their Irish heritage or in support of the Irish culture and spirit. They also prepare it because it’s delicious. In the days before refrigeration, meat was dry-cured in coarse "corns" of salt. The salt, some the size of kernels of corn, were rubbed into the beef to keep it from spoiling and to preserve it. 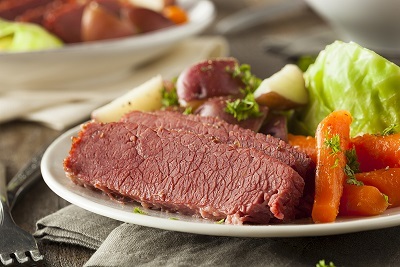 Today brining -- the use of salt water -- has replaced the dry salt cure, but the name "corned beef" is still used, rather than "brined" or "pickled" beef. Commonly used spices that give corned beef its distinctive flavor are peppercorns and bay leaf. Of course, these spices may vary regionally. Corned beef and cabbage, I hate to say, is really not a traditional Irish meal. North Americans adopted this meal as an "official" meal to help celebrate Saint Pats Day. How that came about can be discovered by reading the suggested menu page for Saint Patrick’s Day. 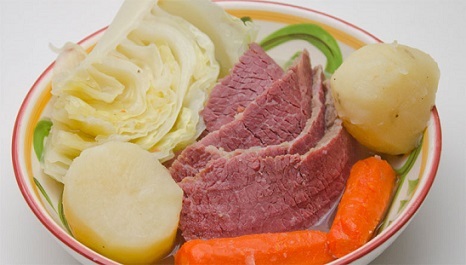 Whether you are interested in Corned Beef and Cabbage because of Saint Pats Day or you just happen to like corned beef, you've come to the right place. This recipe is a favorite restaurant recipe. Preparation time: 20 minutes. Cooking time 2 1/2 - 3 hours. Serves 8-10. 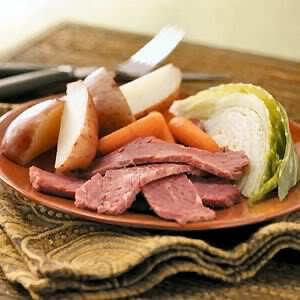 Enjoy this favorite restaurant recipe for corned beef cabbage and the friends you share it with.